Hey! Is your friend being attacked online? Talk to her How is she? What does she want to do? When? What doesn't she want to do? Screenshot and take notes about the attacks. Help her decide what action to take. Create a support group for your friend. Manage the targeted account for her. Send public and/or private messages of support. 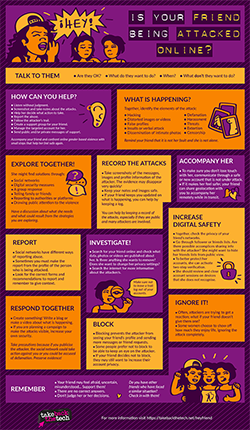 Accompany your friend and confront online gender-based violence with small steps that help her feel safe again. Take screenshots of the messages, images and profile information of the attacker. The evidence may disappear quickly! If your friend keeps you updated on what is happening, you can help by keeping a log. Keep your notes and images safe. You can help record attacks, especially when they are public and there are many attackers involved. Social networks have different ways of reporting abuse. Sometimes you must make the report from the profile of the person who is being attacked. Look for the correct forms and recommendations to report and remember to give context. To make sure you don’t lose touch with her, communicate through a safe or new account that is not under attack. If it makes her feel safer, your friend can share her geolocation with you to accompany her remotely while she is in transit. Blocking prevents the attacker from seeing your friend's profile and sending more messages or friend requests. Some people prefer not to block to be able to keep an eye on the attacker’s activity. If your friend chooses not to block, they may still want to increase the privacy of their profile. Create something! Write a blog or make a video about what is happening. If you are planning a campaign to make the attacks visible, increase your own security. Take precautions because if you publicise the attacker, the social network could take action against you or you could be accused of defamation. Preserve evidence! Search for your friend online and check what data, photos or videos are published about them. Is there anything they want to remove? Do they want to change their privacy settings? Search the internet for more information about the attacker/s. Make sure not to leave a trail; log out of your accounts. Often, attackers are trying to get a reaction; what if your friend denies them what they want? Your friend may decide to continue online as if nothing happened, ignoring the attacks. Have a discussion about what she needs and what could result from the strategies you are exploring. Together, check the privacy of your friend's networks. Go through follower or friends lists. Are there possible accomplices sharing info with the attacker? She might want to hide her friends’ list from public view. To better protect her accounts, she can activate two-step verification. She should review and close account sessions on devices that she does not recognise. Your friend may be experiencing fear, confusion, uncertainty ... Support her! There are no correct answers. Do you have other friends who have faced a similar situation? Check in with them!